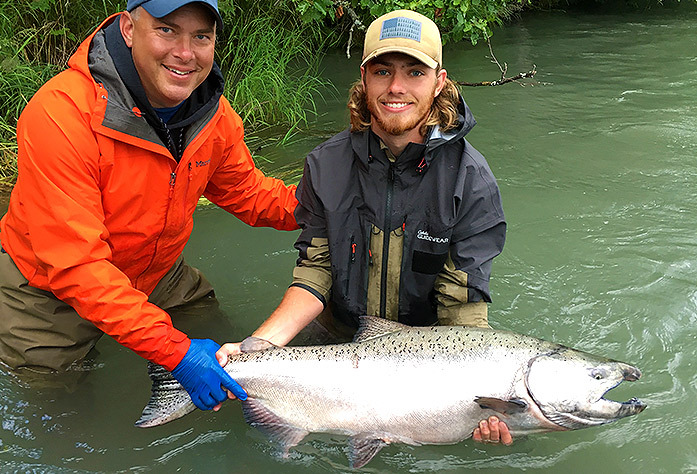 Kenai River Kings are like no other salmon you’ve ever seen! They are big, powerful and world-class. 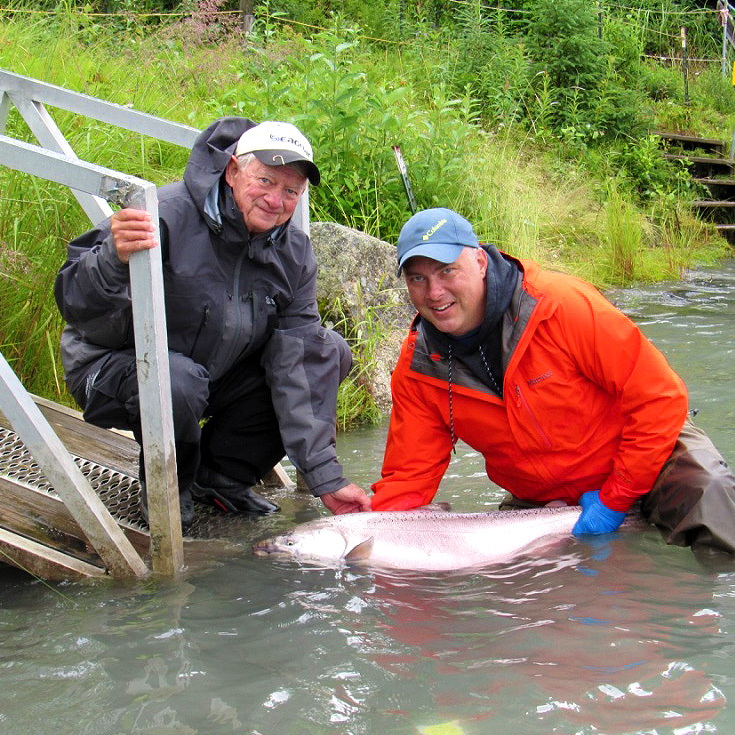 In fact, the Kenai River holds the present world-record for a King Salmon at 97 lb. 4 oz. It has also produced eight of the ten biggest Kings ever documented on rod and reel! The success rate of catching these fish is relatively low (1-4 Kings per boat), but when you fish with us, don’t be surprised if you hook the salmon of a lifetime! It’s the Kenai Kings genetics and age structure that really dictate their tremendous size. 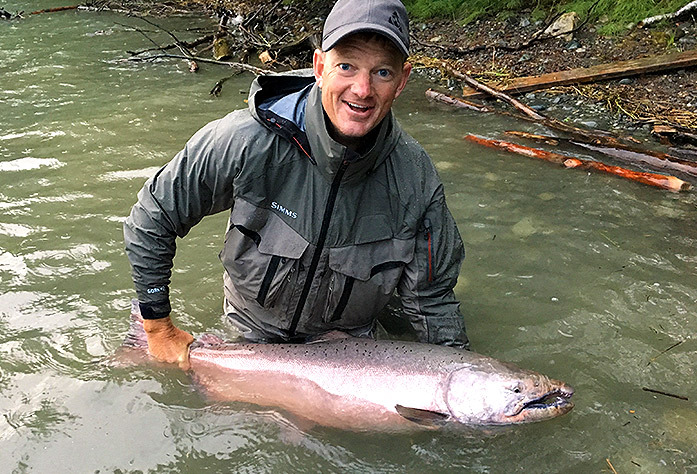 Like most Chinook, the vast majority of Kenai Kings return to their natural river for their one chance to spawn after spending two, three or four years at sea. However, a very small percentage of these kings, only 1-3%, return after five years at sea. These giant 70 lb. plus beasts are the “five ocean” fish that make the Kenai River world famous. Naturally, a salmon that large is highly sought after and a true trophy for any fisherman. However, the fact that everyone wants to catch one is part of what’s hurting the King Salmon population. In recent years, demand has remained high and supply appears to be slowly declining. While there are many factors involved, one thing is clear: if sport and commercial fishermen keep harvesting them like the supply is endless, we won’t have these fantastic fish in years to come. The fish will then be released to continue its journey upriver to successfully spawn. It’s a magical feeling to not only catch such an impressive wild salmon but to have impacted a special fishery in a positive way. And as an added bonus, the lucky angler will then be able to continue fishing and trying hard to land a second or third King, maybe even bigger than the last! Knowing that many of our guests wish to take our delicious fish home to enjoy, we offer many great options for harvest; the abundant sockeye, silvers, halibut, and rockfish that call our waters home immediately come to mind. It is our opinion that Kenai Kings aren’t just another every-day “fill-your-freezer” food fish. They are just too limited and too special. 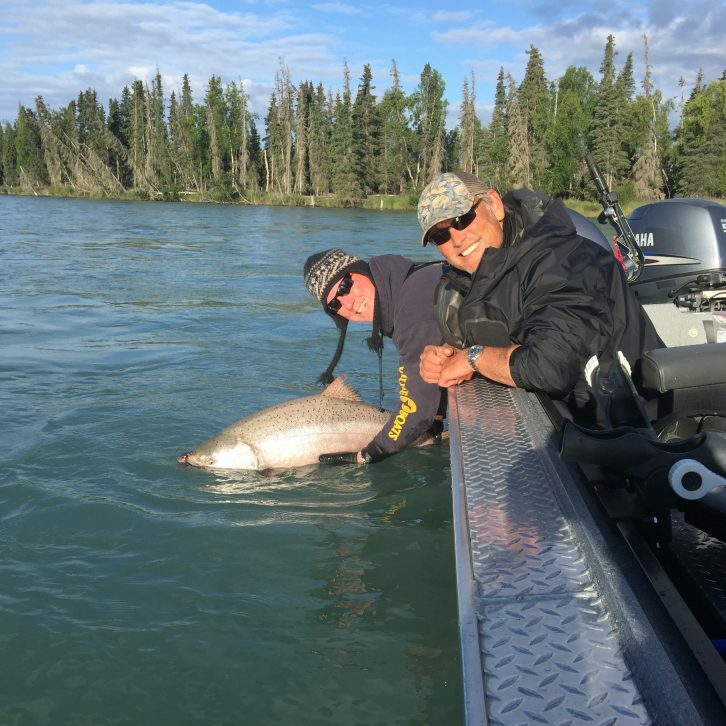 Fishing for Kings on the Kenai is a memory you’ll never forget. This wide but shallow river is a beautiful glacier-green, and while it can sometimes be fairly crowded during peak King season, it remains orderly and enjoyable over all. In fact, even at the busiest time of year, Kenai River King fishing still offers a pleasant experience with frequent sightings of moose, eagles and other Alaska wildlife. Our custom 21 ft. Willie Boat river sleds are powered by quiet 4-stroke outboards. They are extremely comfortable, safe, and fast, getting you quickly to the best salmon holes on the river. Our Kenai King salmon charters take place in the lower 23 miles of the river, where the salmon are in prime condition, fresh from their ocean home and full of fight. If you’re after a King Salmon, please let us know at time of booking. We always consider your personal desires and will help you choose the right fishery and the best time frame! 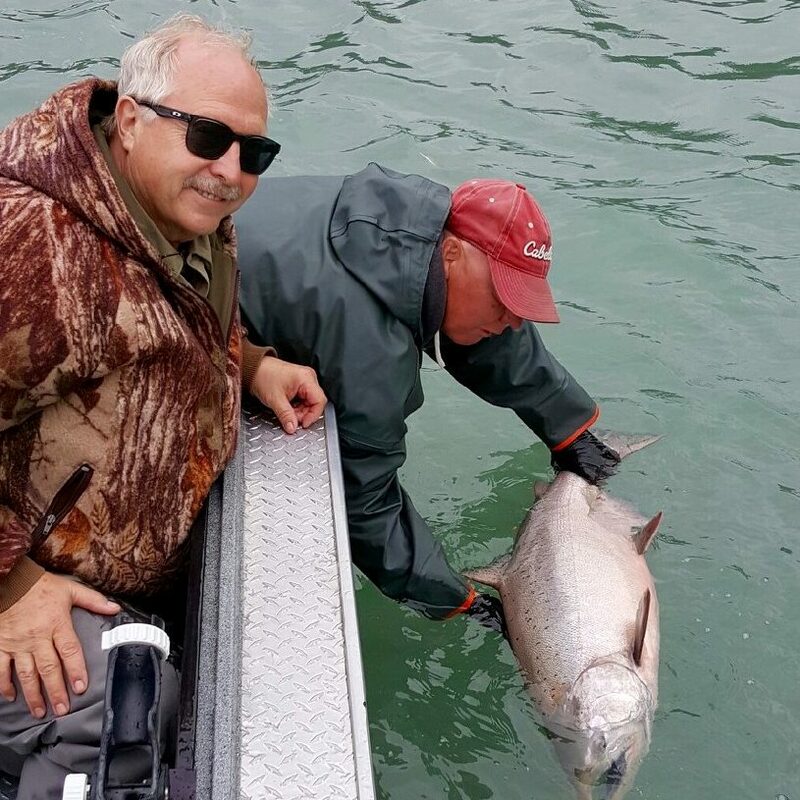 Located just 12 miles south of Soldotna and the famous Kenai River, a Kasilof River King salmon trip is perfect for those anglers looking for an extremely peaceful King charter. A quiet drift boat (non-motorized) trip down the shallow, glacial Kasilof is perfect for both beginning salmon anglers and those seeking a more mellow experience with higher odds of success than trophy Kenai King fishing. 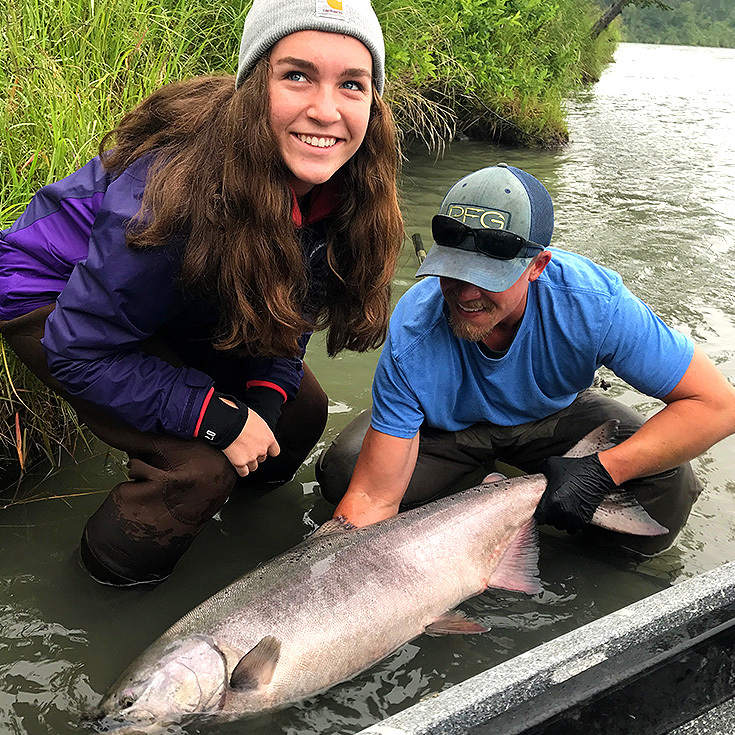 Unlike the Kenai River, the Kasilof River is best known for its relatively high-success rate (2-10 Kings per boat) on Kings that generally weigh about 17-25 lbs. Overall, fishing regulations are more liberal on this hatchery-based river. For example, anglers are not required to quit fishing after keeping a King, a bonus for those visitors wishing to take some great-eating salmon home and spend the entire day fishing! Our custom-built, comfortable four-seat Willie drift boats will float you to some of the most productive King Salmon fishing in Alaska. Our Kasilof King charters take place in the lower six miles of the river and this trip is an “all-day” charter of at least 8.5 hours. This “all-day” trip also means our success rate is much higher than the competitor’s half-day “hurry up” trips! All tackle and gear (light action G.Loomis rods and Shimano reels) is provided, and your catch will be photographed, filleted and bagged at the end of the day by your guide at no extra charge. If you are looking for a relaxed charter with a high success rate on beautiful, bright Kings, this is the trip for you! Please contact us for best times during the peak of the runs, then come and experience what makes the Kasilof River one of the most popular King Salmon fisheries in Alaska!